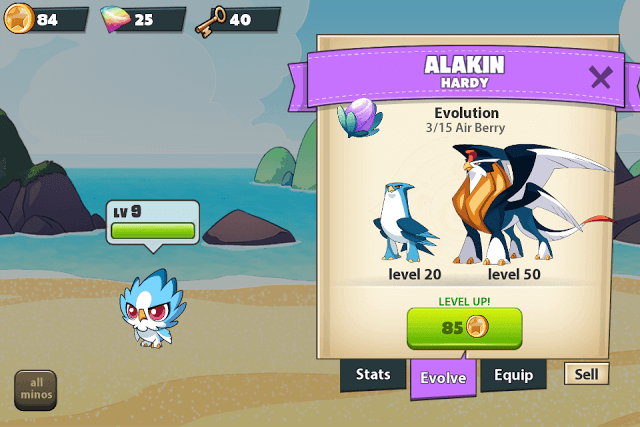 Mino Monsters 2: Evolution is a monster battle game that lets you collect cute-looking creatures, evolve them into stronger Minos, explore islands and unearth secrets. There are plenty of special events and a nice PvP mode where you can fight other players for a chance to earn trophies and rank up the leaderboard. Lately there have been several monster collecting games such as Creature Quest and Monster Super League released for Android. You should try them out if you are into Pokemon-like games. While battling an enemy, tap on the arrow button located at the bottom left corner of the screen to choose the strongest creature. Select your Mino having a “Strong” label, but before that make sure you have at least one energy unit. You will need energy to switch to a new monster. To earn energy you will need to use the current creature to launch an attack. Tap on the enemy to get energy and coins. Once it drops energy, press the arrow button and choose the strongest monster type. Switch to a stronger creature every time a new enemy appears on the battle screen. If you don’t find a “Strong” monster type, choose the one that belongs to the same element, maybe a higher level creature. For example, if the enemy belongs to Fire element and you don’t have a Water element Mino, then choose a Fire element monster if you have it in your team or someone else. Just make sure you don’t choose Earth as the Fire element enemy will deal more damage to your Earth monster. You may also craft a special energy potion before going to battle if you have 3 energy flowers. These flowers may be earned as loot after the completion of a level. Replay old levels to get a chance to win energy flowers. However, chances of getting energy are more if you attack enemy Minos. Berries are used to trigger instant evolution of a Mino Monster. You will need to find a special type of berry for each monster. 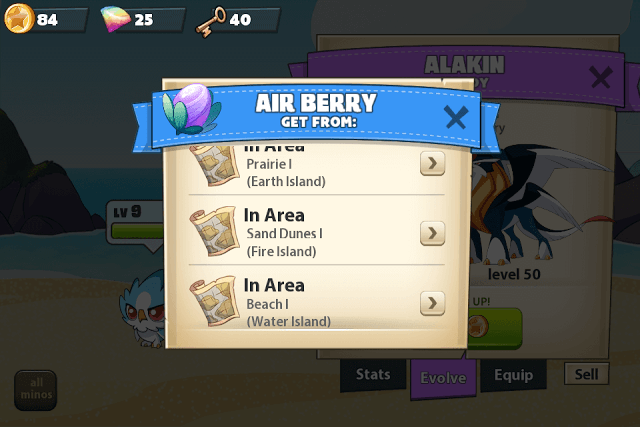 For example, monsters belonging to the Fire element require Fire Berries to evolve whereas those belonging to the Air element need Air berries. To find berries, go to “Team”. Tap on a monster and then tap on the Berry artwork. Once you have accumulated a few hundred coins, head straight to “Team”, tap on a monster and press the “Level-Up” button. Level up each creature on your team and make sure you take all monsters with the same level. Maxing out a creature’s level will evolve it into a more powerful monster. Keep spending coins to reach the max level. For example, Blazel needs to reach level 25 to evolve into a larger and stronger Mino. 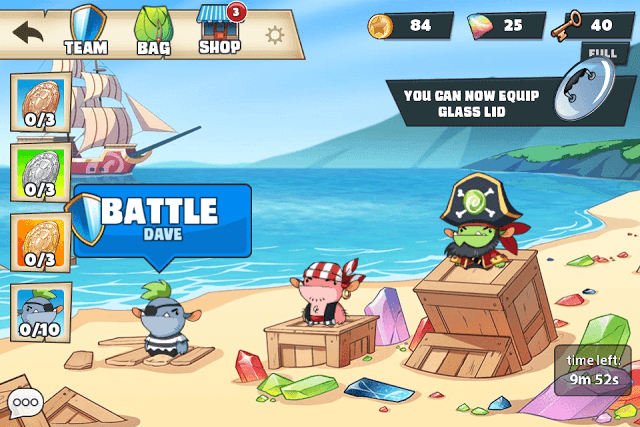 You can play PvP battles if you want to earn extra coins or keep replaying previous levels to earn them faster. Replaying old levels four times will also grant a mega chest. After tapping on a level, look for the ticks and cross just below the “Battle” button. Keep replaying the same level until all “X” marks are turned into ticks. Once you have replayed the level 5 times, you will receive a chest filled with materials and other goodies. Tap on the chest to claim rewards. After replaying a level 5 times, you will unlock “Hard Mode”. Tap on the Hard Mode button and the level banner will change to red. Playing a level in higher difficulty will earn you uncommon or rare rewards. Just make sure your monsters are leveled-up and evolved before trying out the Hard mode. Keys are used to open reward chests. They are refilled after a few minutes but in case you need more keys,just use bronze to craft them via Shop. All you need is 2 Bronze nuggets. Chances of nugget drops are more in PvP missions. Used to heal a Mino by 50 HP. You will need 3 red health flowers to craft a health potion. The health potion appears on the battle screen. Tap on it to refill a monster’s health. Use it when your Mino’s health is less than 50 percent. If your monster faints, then you will have to use the purple Revive potion to bring it back to life. Always have health potions with you. You will need 3 energy flowers to craft this potion. Use it when a monster or monsters don’t drop energy. Play the Candy Cove event and defeat pirates to earn sugar crystals. Tap on “Islands” and tap on the Candy Cove icon. You will have to defeat pirates and collect doubloons if you want to earn crystal rewards. Bronze doubloons give you green sugar crystals. Silver doubloons give red sugar crystals. Collecting gold doubloons give purple crystals. There are a total of 5 attempts and to you may have to wait a few minutes for every new attempt. Green Sugar Crystals are found in Volcano, Waterfall Heights, Water, Electric Caves, Mountain, Fire and Earth islands. Red Sugar Crystals are found on all islands mentioned above as well as from the Candy Cove Quest and the Item chest. You may also get red crystals as random drops from defeated monsters in some levels. Blue Sugar Crystals, although rare, can be found on all 7 islands plus the item chest. Login every day and you may receive sugar crystals some day. Keep an eye on Daily Quests and try to complete them before the timer resets. Daily Quests offer simple tasks like completing a set number of PvP and story-based battles, taming Minos, selling or leveling-up monsters. You will be handsomely rewarded for each finished task. The rewards and tasks are randomly chosen after the timer resets. 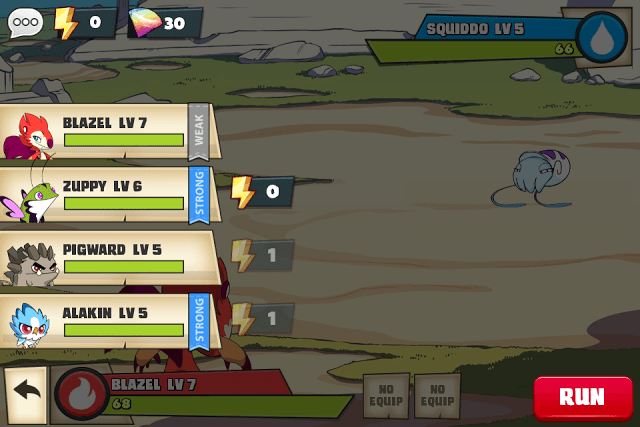 When fighting an enemy, keep an eye on the skill profile at the bottom right corner of the screen. The skill gets activated when you have energy. Tap on the skill to launch a special attack. Use the skill when you are battling a boss or when your monster’s health is too low and you need to defeat the stronger enemy ASAP. You don’t want to mess with someone who has higher-level monsters in a PvP battle, better choose a player who has same-level monsters or lower-level-monsters. Chances of winning against them are more than against higher-level Minos. Tap on a player Mino and you can see your opponent’s monsters and their levels just below “Vs”. Select a player who has more same-level or lower-level monsters and win more PvP battles. Have more monsters with high Defense in your team. High DEF monsters take less damage. Go to “Team” and tap on a creature to check its stats. Note down each creature’s defense stats and add those that have a higher Def value than others. Play the “Treasure Fields” event to earn bronze nuggets. Use them to craft keys. Equip your creatures with items like paper hat, glass lid etc. These items can be received as drops or rewards from loot chests. In “Team”, tap on a creature and then select “Equip”. Tap on the blue equip button and choose an item. Most items require monsters to reach a certain level before you can use them. Items will give your monsters extra abilities in battles.